Insolvency refers to the situation in which a firm or individual is unable to meet financial obligations to creditors as debtsCurrent LiabilitiesCurrent liabilities are financial obligations of a business entity that are due and payable within a year. A company shows these on the balance sheet. A liability occurs when a company has undergone a transaction that has generated an expectation for a future outflow of cash or other economic resources. become due. Before beginning legal insolvency proceedings, the firm or individual may get involved in making an informal arrangementDebt ScheduleA debt schedule lays out all of the debt a business has in a schedule based on its maturity and interest rate. In financial modeling, interest expense flows into the income statement, closing debt balance flows onto the balance sheet, principal repayments flow through the cash flow statement, completing the scheudle with their creditors, such as crafting alternative payment options. 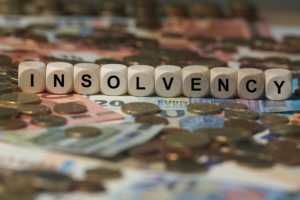 An insolvent firm may decide to file for bankruptcyBankruptcyBankruptcy is the legal status of a human or a non-human entity (a firm or a government agency) that is unable to repay its outstanding debts to creditors. Generally, it is initiated by the debtor and imposed by a court protection, which is a court order that oversees the liquidation of the company’s assets. Insolvency is a state of financial distress, whereas bankruptcy is a legal proceeding. This occurs when the firm or individual theoretically has enough assets to pay off creditors but not the appropriate form of payment. In short, the debtor may have considerable assets but lack cash on hand. Cash flow insolvency refers to the lack of liquid assetsTangible AssetsTangible assets are assets with a physical form and that hold value. Examples include property, plant, and equipment. Tangible assets are seen or felt and can be destroyed by fire, natural disaster, or an accident. Intangible assets, on the other hand, lack a physical form and consist of things such as intellectual propertyr to fulfill debt obligations. Such a situation can sometimes be solved by negotiation. For instance, the creditor may be willing to wait for repayment, giving the debtor a reasonable amount of time to sell less liquid assets, converting them into cash. In exchange for being granted more time to pay down their debt, the debtor may offer oragree to pay the lender a penalty in addition to the principal and interest owed. When the firm or individual does not have enough assets to meet financial obligations to creditors, it is called balance-sheet insolvency. The company or individual has negative net assets. In this case, there is a much higher probability that bankruptcyBankruptcyBankruptcy is the legal status of a human or a non-human entity (a firm or a government agency) that is unable to repay its outstanding debts to creditors. Generally, it is initiated by the debtor and imposed by a court proceedings will be filed. Inadequate accounting or human resource personnel: Sometimes, hiring personnel who lack proper skills and experience may lead to insolvency. This can lead to improper creation and follow-up of budgets and expenses, leading to dilution of the company’s resources, accompanied by inadequate revenues. Lawsuits from customers or business associates: A business that has become subject to multiple lawsuits, with potentially very high contingent liabilities, may suffer so much damage to its daily operations that it cannot remain a viable business. Inability to cater to changing customer needs: Sometimes companies fail to evolve according to the changing needs or desires of customers. They tend to lose customers who find better quality or variety of products or services from other companies. The company loses profits and develops unpaid bills if it does not adapt to the changing marketplace. Increasing production costs: Sometimes a business may incur higher production or procurement costs, such that its profit margins are significantly reduced. This, in turn, leads to loss of income and the company’s inability to fulfill its obligations to creditors. Modern insolvency legislation does not focus on liquidation and elimination of insolvent entities. Rather, it aims more to remodel the financial structure of the debtors so as to enable the continuation of the business. This is referred to as a business turnaround or business recovery. However, in some jurisdictions it is an offense for a company to continue after being insolvent. Debt restructuring is a process that permits a firm or an individual facing financial distress or problems in cash flow to renegotiate their debts in order to restore liquidity and enable them to continue operating. The process is generally handled by professional insolvency and debt restructuring professionals. It is usually a less expensive and a better alternative to bankruptcy. The resources below may be helpful in deepening your understanding of insolvency issues, bankruptcy, and corporate financing.